8/17/ 2013 through 1/5/ 2014--- Maya Hayuk weaves visual information from her immediate surroundings into her elaborate abstractions, creating an engaging mix of referents from popular culture and advanced painting practices while connecting to the ongoing pursuit of psychedelic experience in visual form. 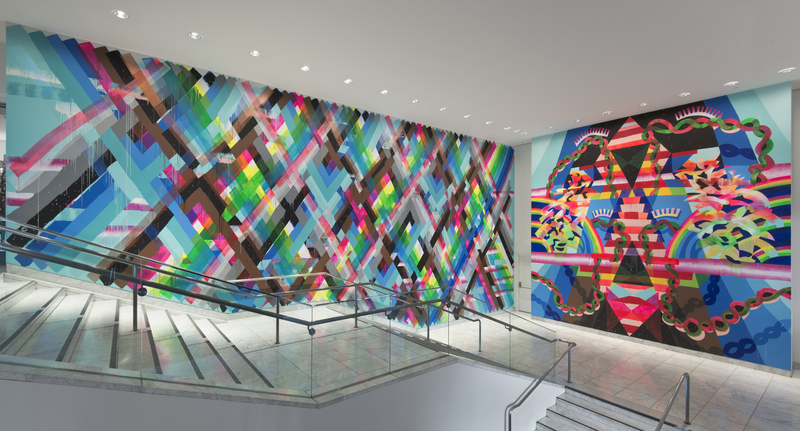 For her first one-person museum exhibition in the United States Hayuk has made a site-specific mural on the Lobby Wall. Hammer Projects: Maya Hayuk is organized by Hammer assistant curator Corrina Peipon. Lunchtime Art Talks take place every Wednesday at 12:30pm. The Hammer's curatorial department leads free and insightful 15-minute discussions about works of art currently on view or from museum collections. This talk will be led by Corrina Peipon, assistant curator.